Abstract. Glomerular accumulation of extracellular matrix (ECM) is the common pathologic feature following glomerular injury, and the alteration in the synthesis and degradation of ECM may be involved in the glomerular accumulation of ECM. Glomerular fibrin formation occurs in various forms of human and experimental glomerulonephritis, and it may play an important role in progressive glomerular injury. Thrombin, a multifunctional serine proteinase that is generated at the site of vascular injury, has central functions in hemostasis and it also shows various biologic effects. In this study, it is hypothesized that thrombin may alter the production and the degradation of type IV collagen, which is an important component of ECM in the glomeruli. Human mesangial cells (HMC) were cultured, and the levels of type IV collagen, tissue inhibitor of metalloproteinase-1 (TIMP-1), and matrix metalloproteinase-2 (MMP-2) in the culture supernatants were measured by enzyme immunoassay using specific antibodies. MMP-2 activity was also evaluated by zymography using polyacrylamide/sodium dodecyl sulfate gel-containing gelatin. Thrombin increased the production of type IV collagen and TIMP-1 in a dose- and time-dependent manner, but it did not increase MMP-2. Thrombin also stimulated the gene expressions of the type IV collagen and TIMP-1 in HMC in a dose- and time-dependent manner. Thrombin treated with diisopropylfluorophosphate, a serine proteinase inhibitor, did not show any of these effects. Hirudin, a natural thrombin inhibitor, and anti-transforming growth factor-β-neutralizing antibody inhibited the stimulating effect of thrombin. These findings suggest that thrombin may contribute to the excessive accumulation of ECM and progression of glomerulosclerosis through an increase of type IV collagen production and a decreased matrix degradation presumably via a transforming growth factor-β-dependent mechanism. Glomerular accumulation of extracellular matrix (ECM) is the common pathologic feature of glomerular injury, and the alteration in the synthesis and degradation of ECM may be involved in the glomerular accumulation of ECM. Glomerular ECM has been shown to consist of type IV collagen, laminin, heparan sulfate proteoglycan, fibronectin, and other proteins. Glomerular deposition of type IV collagen has been reported in human glomerular diseases (1,2,) and experimental models (3,4). Matrix metalloproteinase-2 (MMP-2) is an important proteolytic enzyme demonstrated to degrade type IV collagen in in vivo as well as in vitro studies, and it is shown to be synthesized by mesangial cells in vivo as well as in vitro (5,6,7). Mesangial cells also synthesize tissue inhibitor of metalloproteinase-1 (TIMP-1), which can inhibit MMP-2 (8,9). Recent investigations have shown that an imbalance between matrix-degrading metalloproteinases and the inhibitors of these enzymes may contribute to the development of glomerulosclerosis (7,10). Intraglomerular fibrin formation is commonly observed in various types of glomerulonephritis, and the coagulation process has been suggested to contribute to the progression of glomerulosclerosis (11,12,13). Thrombin, a multifunctional serine protease that is generated in the coagulation process and at the site of vascular injury, has central functions in hemostasis. It is well known that thrombin has various biologic effects besides its role in hemostasis. For example, it has been reported that thrombin stimulates the mitogenesis of cultured fibroblasts (14,15), lymphocytes (16), endothelial cells (17), vascular smooth muscle cells (18,19), mesangial cells (20,21), and glomerular epithelial cells (22). It is reported that thrombin can regulate the production of several components of the fibrinolytic system in various cultured cells (22,23,24,25). Thrombin may therefore have an important role in the deterioration of renal function and progression of glomerulosclerosis. In the present study, we examined whether thrombin could influence the production of type IV collagen, TIMP-1, and MMP-2 by cultured human mesangial cells (HMC). HMC derived from human fetal kidneys (16 and 18 wk gestation) were kindly provided by Dr. M. R. Daha (University Hospital of Leiden, The Netherlands). The cells were cultured in Dulbecco's modified Eagle's minimum essential medium (Life Technologies Laboratories, Grand Island, NY) with 20% heat-inactivated fetal calf serum (Bioserum, Canterbury, Australia) at 37°C in 5% CO2. The cells were identified as glomerular mesangial cells by standard criteria (26), i.e., they exhibited a typical stellate morphology when subconfluent and typical hillocks were seen at confluence. Staining for actin, myosin, and type IV collagen was positive by immunofluorescence, and the cells were negative for cytokeratin and factor VIII. The cells were used between passages 6 and 9 for the experiments. The concentrations of type IV collagen and TIMP-1 in culture supernatants were quantified by enzyme immunoassay (EIA) using the Panaassay IV-C and human TIMP-1 assay kits (Daiichi Kagaku Yakuhin, Tokyo, Japan). MMP-2 was measured by a one-step sandwich EIA, as described previously (27). This assay useed a pair of monoclonal antibodies raised against the precursor form of MMP-2 (proMMP-2) purified from the conditioned medium of interleukin-1α-treated human skin fibroblasts (CCD-41SK; American Type Culture Collection [ATCC] no. CRL1505) (28) and against a synthetic peptide corresponding to the N-terminal domain (residues 17 to 35) of proMMP-2. The sensitivity of this EIA was 0.24 ng/ml, and linearity was obtained between 1.0 and 500 ng/ml. HMC were cultured in 12-well plates (Falcon; Becton Dickinson, Franklin Lakes, NJ) and grown to confluence, which means HMC covered the entire plate. Subsequently, the cells were washed with Hanks' balanced salt solution (Life Technologies) and cultured with Dulbecco's modified Eagle's minimum essential medium containing 0.2% bovine serum albumin (Sigma, St. Louis, MO) for 24, 48, or 72 h. Then type IV collagen, TIMP-1, and MMP-2 in the cell supernatants were measured. The cells in each well were lysed in 1N NaOH, and the protein content was measured by the method of Lowry et al. (29), using bovine serum albumin as a standard. The levels of type IV collagen, TIMP-1, and MMP-2 in culture supernatants were expressed as ng per μg of lysed HMC protein. We measured type IV collagen, TIMP-1, and MMP-2 in the supernatants of HMC incubated with 0.5 to 5.0 U/ml α-thrombin (Sigma) for 72 h to determine its dose-dependent effect. The dosage of thrombin was adopted according to a previous report (23). Time effect of thrombin was also examined by incubating HMC with or without 5.0 U/ml thrombin for 24, 48, and 72 h. We also examined the effect of diisopropylfluorophosphate (DFP; Wako Pure Chemical Industries, Osaka, Japan)-treated thrombin (DFP-thrombin) on the production of type IV collagen and TIMP-1. DFP is a serine proteinase inhibitor, and DFP-thrombin has no enzymatic activity. In addition, we examined the inhibitory effect of recombinant hirudin (American Diagnostica, Greenwich, CT), a specific natural thrombin inhibitor. DFP-treated thrombin was prepared by reacting thrombin (200 U/ml) with 10 mM DFP at pH 7.2 for 1 h at 37°C, and then was dialyzed overnight against 0.01 M phosphate-buffered saline at pH 7.4. HMC were incubated for 72 h with 5.0 U/ml thrombin, 5.0 U/ml DFP-thrombin, 5.0 U/ml thrombin plus 10.0 U/ml hirudin, or 10.0 U/ml hirudin, and the levels of type IV collagen and TIMP-1 in the cell supernatants were measured. Finally, we examined the effect of anti-transforming growth factor-β (TGF-β)-neutralizing antibody (King Brewing Co., Kakogawa, Japan), which is a polyclonal rabbit antibody, on the production of type IV collagen and TIMP-1. HMC were incubated for 72 h with 5.0 U/ml thrombin, 5.0 U/ml thrombin plus 50 μg/ml anti-TGF-β antibody, or 5.0 U/ml thrombin plus 50 μg/ml normal rabbit IgG, and the levels of type IV collagen and TIMP-1 in the cell supernatants were measured. The cytotoxicity by thrombin, DFP-thrombin, or hirudin was evaluated by assessing lactate dehydrogenase (LDH) release from HMC. HMC were incubated in 24-well plates for 72 h with 5.0 U/ml thrombin, 5.0 U/ml DFP-thrombin, or 10.0 U/ml hirudin, and the amount of LDH in the cell supernatants was measured. After removing the cell supernatants, HMC were lysed by mellitin (50 μg/ml, Sigma), and the amount of LDH in the cells was also measured. LDH was quantified by a colorimetric method using the LDH assay kit (Sanassay LDH, Sankou Junyaku, Tokyo, Japan). The levels of LDH in the supernatants for 3 wells were 113.3 ± 5.8 Wroblewski units/ml in 5.0 U/ml thrombin, 118.3 ± 10.4 U/ml in 5.0 U/ml DFP-thrombin, 105.3 ± 13.6 U/ml in 10.0 U/ml hirudinin, and 110.0 ± 10.0 U/ml in control. There was no significant difference among LDH levels in the cell supernatants of these groups. There was also no significant difference among LDH levels in the cells of these groups. So it was considered that no cytotoxicity was observed by these agents that we used in this experiment. It is well known that thrombin enhances the proliferation of cultured mesangial cells (20,21). We estimated the proliferation of HMC after confluence by a colorimetric assay using Cell Titer 96TM (Promega, Madison, WI) and by counting cell number. There was not a significant increase of HMC incubated for 72 h with 5 U/ml thrombin. Sodium dodecyl sulfate (SDS) substrate gels (7.5%) were prepared by including gelatin (DIFCO Laboratories, Detroit, MI) in the standard Laemmli acrylamide polymerization mixture at a final concentration of 1 mg/ml. The samples were solubilized in nonreducing sample buffer and electrophoresed using 25 mA/gel. After electrophoresis, the gels were washed in cold 50 mM Tris/HCl, pH 8.0, containing 50 mM NaCl, 10 mM CaCl2, and 0.05% Brij 35 (Sigma). The gels were then incubated overnight in fresh Tris buffer at 37°C. Thereafter, the gels were stained with Coomassie Blue and zones of lysis were visualized. Prestained protein molecular weight standards (Bethesda Research Laboratories, Gaithersburg, MD) were used for designation of molecular weight. For analytical SDS-polyacrylamide gel electrophoresis, HMC were incubated with 0.5 to 5.0 U/ml α-thrombin for 72 h, and 10 μl of cell supernatants were electrophoresed to examine the molecular weight of their proteinases. HMC were stimulated with α-thrombin (0.5 U/ml or 5.0 U/ml) for 3 or 6 h, and then harvested and stored in liquid nitrogen until use. Total RNA was extracted from the frozen cells by a single-step method using RNAzol B (Biotecx Laboratories, Houston, TX). 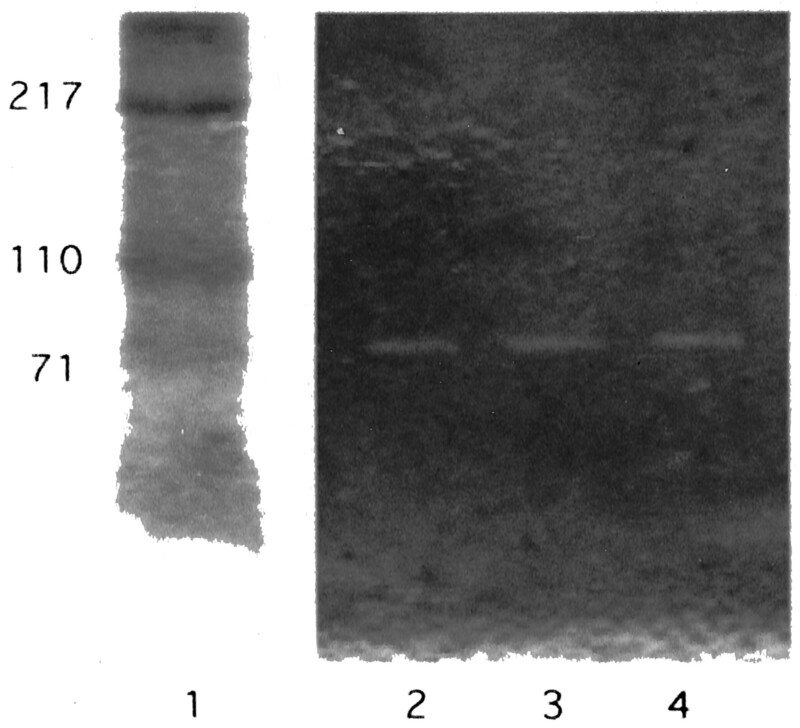 Then RNA samples (15 μg/lane) were subjected to electrophoresis on 1% agarose gel containing 2.2% formaldehyde and transferred onto nylon membranes (Hybond-N, Amersham, Buckinghamshire, United Kingdom) by capillary blotting. Membranes were hybridized overnight at 65°C with cDNA probes in the hybridization buffer containing 5× saline-sodium phosphate-ethylenediaminetetra-acetic acid, 5× Denhardt's solution, and 0.5% SDS. The cDNA probes were labeled with (α-32P) dCTP (3000 Ci/mmol; Dupont, Boston, MA) by random primer extension (30). After hybridization, the membranes were washed and exposed to Reflection film (Dupont) at -80°C with an intensifying screen for 6 h to 3 d. The cDNA probes for human type IV collagen-α2, human TIMP-1, and human glyceraldehyde 3-phosphate dehydrogenase (GAPDH) were purchased from American Type Culture Collection (Rockville, MD). All data are expressed as mean ± SD. Results were compared using one-way factorial ANOVA followed by multiple comparison tests, and two-way repeated-measures ANOVA. The digested zone of 72 kD of mesangial cell proteinase, which is thought to be MMP-2, was demonstrated by 7.5% SDS-polyacrylamide gel electrophoresis including gelatin, and thrombin did not increase the MMP-2 activity. Even when HMC were incubated with 5.0 U/ml thrombin, no gelatinase of other molecular weight was observed (Figure 1). Zymography of human mesangial cell (HMC) supernatant in a 7.5% sodium dodecyl sulfate-polyacrylamide gel containing 1 mg/dl gelatin as a substrate. The gelatin digestion zones represent activated matrix metalloproteinase-2 (MMP-2). Thrombin did not stimulate MMP-2 enzyme activity after 72 h incubation when compared with untreated control supernatant. Representative data from one of two separate experiments are shown. Lane 1, molecular marker; lane 2, control; lane 3, 0.5 U/ml thrombin; lane 4, 5.0 U/ml thrombin. Changes in the concentrations of type IV collagen, TIMP-1, and MMP-2 in the HMC culture supernatants after 72 h of incubation with α-thrombin are shown in Figure 2. The mean level of type IV collagen in four wells was 0.054 ± 0.007 ng/μg cell protein (thrombin 0 U/ml), 0.071 ± 0.006 ng/μg (thrombin 0.5 U/ml), 0.107 ± 0.022 ng/μg (thrombin 2.0 U/ml), and 0.478 ± 0.049 ng/μg (thrombin 5.0 U/ml) (Figure 2A). The mean level of TIMP-1 in four wells was 15.50 ± 4.59 ng/μg cell protein (thrombin 0 U/ml), 17.82 ± 4.57 ng/μg (thrombin 0.5 U/ml), and 27.82 ± 1.45 ng/μg (thrombin 5.0 U/ml) (Figure 2B). The mean level of NMP-2 in four wells was 0.61 ± 0.12 ng/μg cell protein (thrombin 0 U/ml), 0.62 ± 0.16 ng/μg (thrombin 0.5 U/ml), and 0.56 ± 0.03 ng/μg (thrombin 5.0 U/ml) (Figure 2C). Thrombin significantly increased the production of type IV collagen and TIMP-1, but it did not change the amount of NMP-2. Time effect of thrombin was also examined by incubating HMC with or without 5.0 U/ml thrombin for 24, 48, and 72 h. Thrombin significantly stimulated the production of type IV collagen (Figure 3A) and TIMP-1 (Figure 3B) in a time-dependent manner. We also examined the effects of DFP-thrombin, recombinant hirudin, and anti-TGF-β-neutralizing antibody on the production of type IV collagen and TIMP-1. DFP-thrombin (5.0 U/ml) did not stimulate type IV collagen production, and hirudin (10.0 U/ml) inhibited the stimulating effect of thrombin, while hirudin itself did not influence type IV collagen production (Figure 4A). Anti-TGF-β antibody blocked the stimulating effect of thrombin in type IV collagen production, while normal rabbit IgG did not. Anti-TGF-β antibody itself did not influence type IV collagen production (Figure 4B). 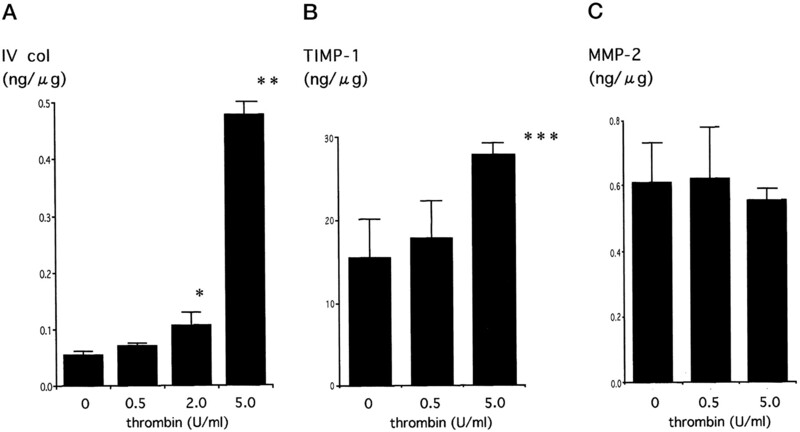 DFP-thrombin (5.0 U/ml) did not stimulate TIMP-1 production. Recombinant hirudin (10.0 U/ml) inhibited the stimulating effect of thrombin, while hirudin itself did not influence TIMP-1 production (Figure 5A). Anti-TGF-β antibody blocked the stimulating effect of thrombin in TIMP-1 production by HMC, while normal rabbit IgG did not. Anti-TGF-β antibody itself did not influence TIMP-1 production (Figure 5B). 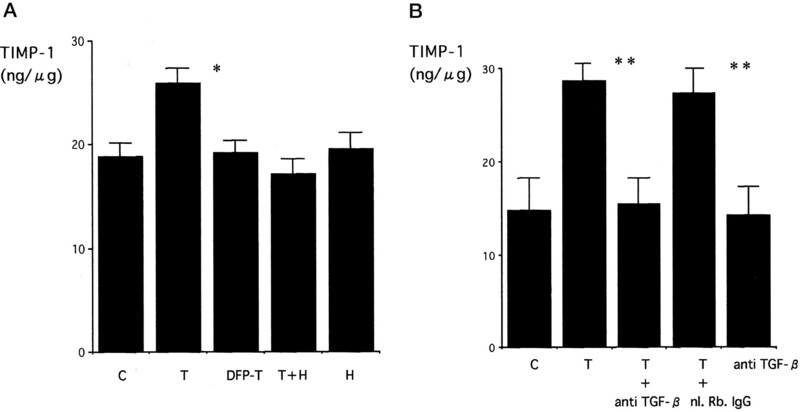 Thrombin stimulated the production of type IV collagen (A) and tissue inhibitor of metalloproteinase-1 (TIMP-1) (B) by HMC, but it did not stimulate MMP-2 production (C). Values are the mean ± SD for four wells, and representative data from one of two experiments are shown, respectively. *P < 0.02 versus 0 U/ml thrombin; **P < 0.001 versus 0, 0.5, and 2.0 U/ml thrombin; ***P < 0.02 versus 0 and 0.5 U/ml thrombin. Time course of the production of type IV collagen (A) and TIMP-1 (B) by HMC in the absence ([UNK]) or presence (○) of 5 U/ml thrombin. Thrombin stimulated the production of type IV collagen (P < 0.0001) and TIMP-1 (P < 0.005) in a time-dependent manner. Results are expressed as ng per μg cell protein. Values are the mean ± SD for four wells. Thrombin (T; 5 U/ml) stimulated type IV collagen production by mesangial cells. However, 5 U/ml diisopropylfluorophosphate (DFP)-thrombin (DFP-T) did not stimulate type IV collagen production. Hirudin (H; 10 U/ml) inhibited the stimulating effect of thrombin, but hirudin itself did not influence type IV collagen production. (B) Anti-transforming growth factor-β (TGF-β) antibody blocked the stimulating effect of thrombin in type IV collagen production by mesangial cells, while normal rabbit IgG (nl.Rb.IgG) did not. Anti-TGF-β antibody itself did not influence type IV collagen production. Values are the mean ± SD for three wells, and representative data from one of two separate experiments are shown, respectively. C, control. *P < 0.0001 versus other groups; **P < 0.0001 versus C and T + anti-TGF-β. Thrombin (T; 5 U/ml) stimulated TIMP-1 production by mesangial cells. However, 5 U/ml DFP-thrombin (DFP-T) did not stimulate TIMP-1 production. Hirudin (H; 10 U/ml) inhibited the stimulating effect of thrombin, but hirudin itself did not influence TIMP-1 production. (B) Anti-TGF-β antibody blocked the stimulating effect of thrombin in TIMP-1 production by mesangial cells, while normal rabbit IgG (nl.Rb.IgG) did not. Anti-TGF-β antibody itself did not influence TIMP-1 production. Values are the mean ± SD for three wells, and representative data from one of two separate experiments are shown, respectively. C, control. *P < 0.0005 versus other groups; **P < 0.01 versus C and T + anti-TGF-β. Northern blot analysis showed that mesangial cells expressed type IV collagen and TIMP-1 mRNA under basal conditions. 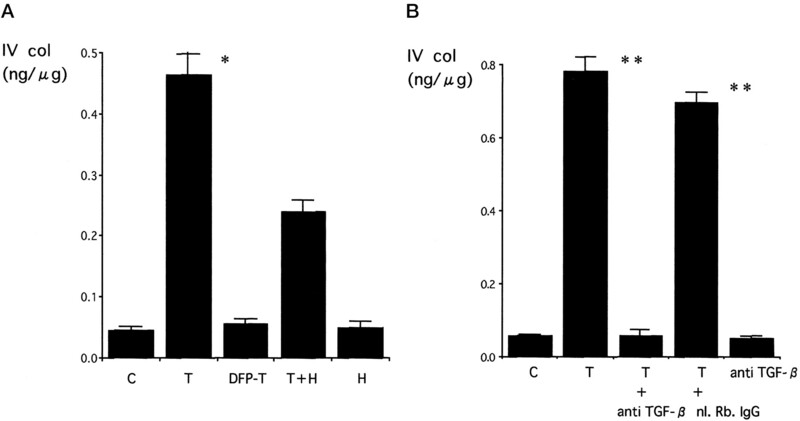 Thrombin (0.5 to 5.0 U/ml) upregulated the gene expressions of type IV collagen and TIMP-1 in a dose-dependent manner compared with the expression of glyceraldehyde 3-phosphate dehydrogenase (GAPDH), which is used as internal control (Figure 6A), and incubation with 5.0 U/ml thrombin for 3 and 6 h upregulated the gene expressions of type IV collagen and TIMP-1 in a time-dependent manner (Figure 6B). (A) Type IV collagen mRNA and TIMP-1 mRNA expressions of HMC incubated with media alone, media with 0.5 U/ml thrombin, and media with 5.0 U/ml thrombin for 6 h. Type IV collagen mRNA and TIMP-1 mRNA of mesangial cells incubated with thrombin were increased in a dose-dependent manner compared with GAPDH. (B) Type IV collagen mRNA and TIMP-1 mRNA expressions of HMC before incubation, 3 h, and 6 h after incubation with 5.0 U/ml thrombin. Type IV collagen mRNA and TIMP-1 mRNA of mesangial cells incubated with thrombin were increased in a time-dependent manner compared with GAPDH. Representative data from one of two separate experiments are shown, respectively. The accumulation of ECM is a common feature of glomerulosclerosis in many glomerular diseases. Because type IV collagen is an important component of the glomerular basement membrane and the mesangial matrix, alterations of its synthesis and degradation might contribute to the development of glomerulosclerosis. Glomerular cells have the ability to produce several ECM components, as well as several metalloproteinases and TIMP (10,31). Metalloproteinases can degrade the glomerular ECM and glomerular basement membrane, while TIMP inhibit their activity. Thus, an imbalance in the production of these enzymes may induce the destruction or the impaired remodeling of glomerular architecture (7,8,9,32). Recent investigations have suggested a pathologic role of matrix-degrading metalloproteinases and their inhibitors in glomerular injury (7,32,33). The gene expressions of these enzymes in the glomeruli are often altered in pathologic situations (33). The coagulation process, including platelet aggregation and localized intravascular coagulation, has been implicated as either a primary pathogenetic factor or a secondary mediator of glomerular injury in a variety of glomerular and vascular renal disease (11,12,13). Fibrin-like material has been demonstrated in the glomeruli, and fibrin degradation products have been found in the serum and urine of patients with glomerulonephritis. However, the mechanisms responsible for glomerular injury by the coagulation process have not been well established. Depression of blood flow caused by intraglomerular coagulation may injure glomerular cells and coagulation factors and/or platelets may cause glomerular injury by altering glomerular metabolism. Thrombin is the serine protease that converts fibrinogen to fibrin, and is well known to have various biologic activities. Thrombin is mitogenic for lymphocytes, endothelial cells, and other types of cells (16,17,18,19), and it can regulate the production of components of the fibrinolytic system by various cultured cells (22,23,24,25). In the present study, we found that thrombin accelerated the production of type IV collagen and TIMP-1, but not MMP-2, by cultured HMC. It was also found that thrombin upregulated the gene expressions of type IV collagen and TIMP-1 in HMC. Such changes could lead to the excessive production and reduced degradation of type IV collagen, and cause the glomerular accumulation of type IV collagen. In contrast, a stimulating effect was not seen in DFP-treated thrombin. DFP is a serine proteinase inhibitor and it blocks the enzyme activity of thrombin. The specificity of the effect of thrombin was also tested by addition of hirudin, a natural specific thrombin inhibitor that blocks both the proteolytic and membrane receptor binding functions of thrombin (34,35). At 10 U/ml, hirudin significantly inhibited the stimulating effect of thrombin in the production of type IV collagen and TIMP-1. The enzymatic activity of thrombin has been reported to be necessary for its mitogenic effect on smooth muscle cells (36,37), while inactivation of the thrombin catalytic site by both hirudin and DFP blocks the thrombin-mediated increase of tissue plasminogen activator and plasminogen activator inhibitor-1 (23). The recent cloning of the thrombin receptor on platelets and vascular endothelial cells has revealed a novel proteolytic mechanism of receptor activation (38), in which thrombin cleaves the receptor N-terminal extension site to create a new N-terminal that functions as a tethered ligand and activates the receptor. This notion is supported by the fact that DFP-thrombin did not stimulate the production of type IV collagen and TIMP-1, and hirudin completely suppressed TIMP-1 production and it considerably suppressed type IV collagen production. To our knowledge, there have been no previous investigations regarding the effects of thrombin on type IV collagen, MMP-2, and TIMP-1 production by cultured cells. Thrombin is generated at sites of glomerular injury by activation of the intrinsic or extrinsic coagulation pathway. Our findings suggest that thrombin may contribute to glomerular sclerosis in part by stimulating ECM production as well as by increasing metalloproteinase inhibitor expression in mesangial cells. Many in vivo and in vitro studies have shown the effects of cytokines and growth factors on the accumulation of ECM (39,40,41,42,43,44,45,46,47), which may depend on the balance between synthesis and degradation. It is reported that various modulators may influence the balance of metalloproteinases and TIMP within the mesangium and determine the overall direction of matrix metabolism (48,49). Kitamura et al. demonstrated that a high glucose concentration upregulates the gene expression of type IV collagen, TIMP, and laminin, but not that of transin, which is a matrix metalloproteinase (8). They also showed that heparin selectively inhibits expression of the transin gene in cultured mesangial cells (50). Martin et al. reported that HMC constitutively secrete MMP-2 and a small amount of MMP-9, which is a 92-kD enzyme, and when the cells were stimulated by IL-1β or phorbol myristate acetate, MMP-9 was increased in a dose-dependent manner, while MMP-2 remained unaffected. They thought that MMP-2 may have an important role in the regular turnover of matrix, while MMP-9 may become predominant in pathologic situations (51). However, in our study, even when HMC were incubated with 5.0 U/ml thrombin, the MMP-2 activity was not increased and no proteinase of other molecular weight was observed. Lovett et al. demonstrated that low concentrations (0.1 to 1.0 ng/ml) of TGF-β increased the production of TIMP in cultured HMC, while high concentrations of TGF-β increased gelatinase activity (52). TGF-β has also been shown to decrease the production of ECM-degrading proteinases and increase the production of their inhibitors in cultured human fibroblasts (53,54). TGF-β has been thought to play a central role in the accumulation of ECM in glomerulonephritis (55,56,57,58). In our study, the stimulating effect of thrombin was completely inhibited by anti-TGF-β antibody. Several authors have reported that thrombin can modulate the production of some cytokines (18,59). We have reported that thrombin also stimulates TGF-β production in cultured HMC (60). Taken together, these data suggest that thrombin stimulates the production of type IV collagen and TIMP-1 through a TGF-β-dependent mechanism. In summary, we have shown that thrombin could stimulate the production of type IV collagen and TIMP-1 by HMC. This effect of thrombin was blocked with anti-TGF-β antibody. Thrombin is released when glomerular injury occurs, and it may play an important role via a TGF-β-dependent mechanism in the progression of glomerulosclerosis.